Final Fantasy XV-themed PlayStation 4 confirmed for the west. 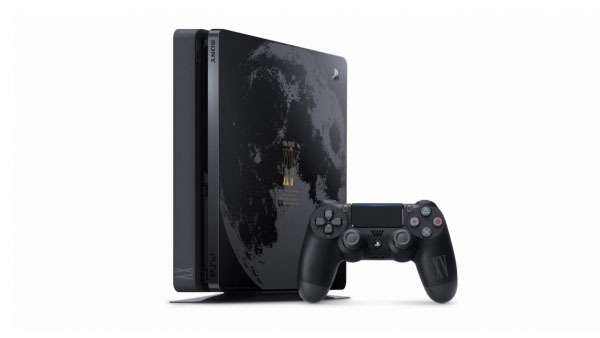 Sony Interactive Entertainment will release the PlayStation 4 Final Fantasy XV Luna Edition model announced for Japan this morning in North America and Europe, the company announced. The bundle includes an original design PlayStation 4 with a one-terabyte hard-drive, an original design DualShock 4, a copy of Final Fantasy XV with an exclusive SteelBook, the Kingsglaive: Final Fantasy XV movie on Blu-ray disc, and multiple pieces of downloadable content (“Royal Raiment Outfit,” “Masamune Weapon,” and “Leviathan Regalia Skin”). In North America, it will be available exclusively at GameStop for $449 USD / $549 CAD. In addition to the Luna Edition bundle, Europe will receive an standard edition Final Fantasy XV bundle including a Jet Black PlayStation 4 with a one-terabyte hard-drive and a copy of Final Fantasy XV on Blu-ray disc. The bundles will launch day and date with Final Fantasy XV on November 29. View a set of beauty shots at the gallery.